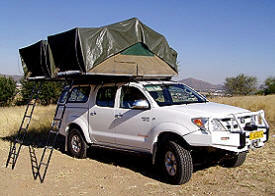 Not without reasons has the range of 4x4 vehicles available for holiday rentals exploded in recent years: Car hire companies in Southern Africa adjusted their fleets to changing customer demand when driving an off-road vehicle came into fashion, when visitors became more adventurous and wished to explore remoter places, or simply wanted a more authentic Africa feel while travelling on well-established routes. 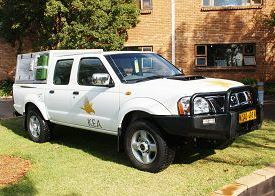 Where else would driving a 4x4 be more befitting than on an African safari?! Far more important though is another reason, which unfortunately often falls victim to the cost implications of renting a 4x4 where it does not appear a necessity: Safety! Not only on rough bush tracks but also on gravel and tarred roads can no other vehicle type offer you more safety than a four-wheel-drive - a 4x4's grip on the road, even on hard corrugated surfaces, is unsurpassed. depending on season and region, possibly under rainy weather conditions. 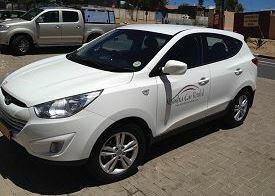 This means your vehicle should not only be comfortable for driving longer distances but also be suitable for any kind of road/road condition while on a cross-country safari. This is why we recommend: If you have to compromise to meet your travel budget. Please let the rental vehicle be the last in line. 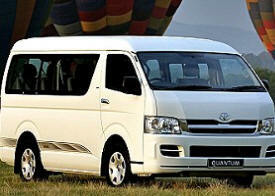 You can count on Unique Tours & Safaris at all times to find the best possible solution! 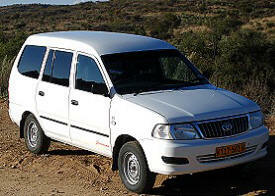 Special conditions apply and cross-border fees will be charged when taking a hired vehicle outside Namibia. 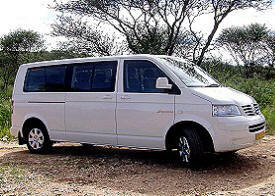 Unique Tours & Safaris will provide details with offers. 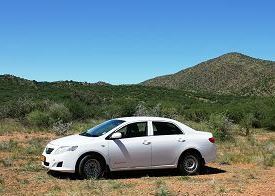 Sedans are normal 2x4 passenger vehicles; available in various makes and sizes but not recommended for longer gravel road driving and not permitted in off-road/4x4 terrain. Available in various makes and sizes, from 12-40 seats; touring buses for groups come with air-conditioning, upholstered seats and other luxuries, and with driver. 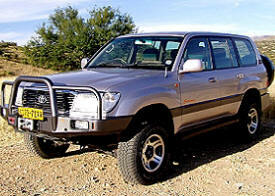 These are known as 'pick-up trucks' outside Southern Africa and the 2x4 Single or Double Cab cousins of the above Toyota Hilux and other makes; mostly a good choice for safaris requiring no 4x4 capabilities. 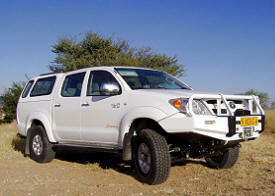 For their reliability and your safety; spare parts are also available in Namibia's neighbouring countries such as Botswana and South Africa; trustable 4x4 system with diff-lock on rear axle; tires with 6-ply reinforced sidewalls - available at tire shops everywhere; highest ground clearance compared to similar models of different makes; strong engine with high KW-output and high torque; 2nd battery system that really works for 12V refrigerators up to -16 degrees Celsius; long-range tank made of stainless steel; reinforced canopy with windows fitted in order to have a good view to the rear. 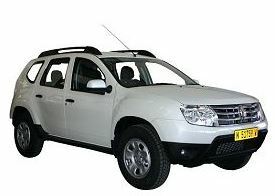 Most car rental companies offer their 4x4s standard equipped with additional bull-bar, roll-bar and tow-bar. small & big plates, cups & mugs, dessert bowls, small/big/medium pots, pan, chopping board, cooking utensils (wooden spoon, bread knife, etc. ), cutlery (knives, forks, spoons, etc. ), tea towel, dish washing cloth, pot scrubber, matches, dish-washing liquid, salt & pepper.